Maragame Monzo took over the Fat Spoon space last month and adds yet another noodles shop to Little Tokyo in Downtown Los Angeles. 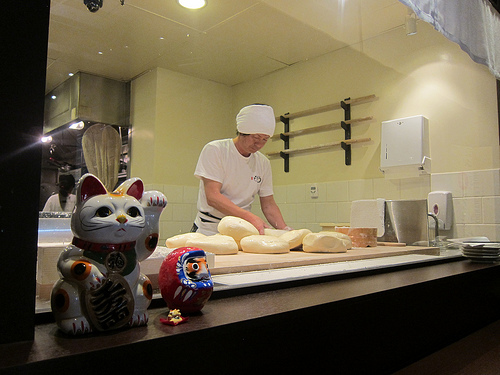 But unlike its neighbor, Daikokuya, Monzo serves handmade udon instead of ramen. 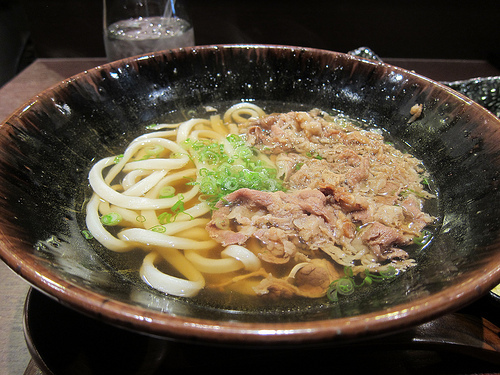 I have always been more of a fan of ramen until I had some really great udon in London and in the South Bay. Going to the South Bay is a trek though and I despaired finding great udon again in LA. I was on my way to Daikokuya when I saw Monzo. Some vague recollection of two new udon places in Little Tokyo caused me to change my course. And I’m glad I did. I found a seat at a corner table but later regretted not squeezing into the busy counter. I missed out on the udon making on my first visit. During lunch, you could get a small rice bowl for $3 ($4 for shrimp tempura) along with your udon. 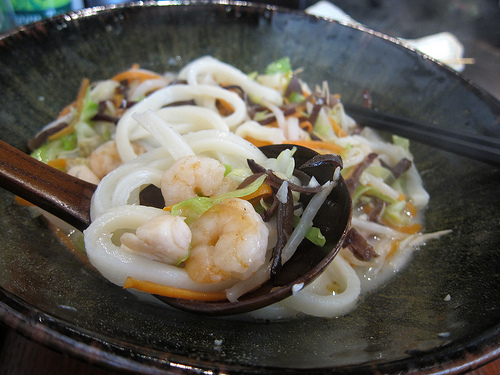 The udon is roughly divided into three sections; with soup, without soup and specialty. 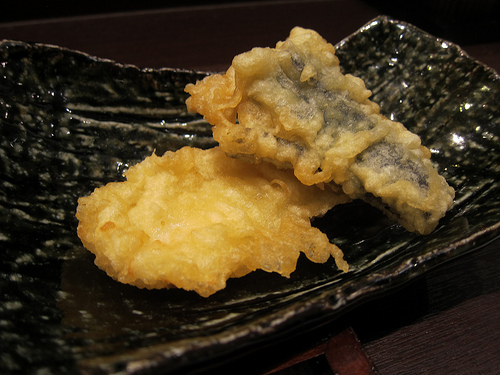 You can also get a range of different tempura. I opted to get champon udon on my first visit and fell in love with the broth. The savory opaque broth had to be boiled seafood shells and bones. 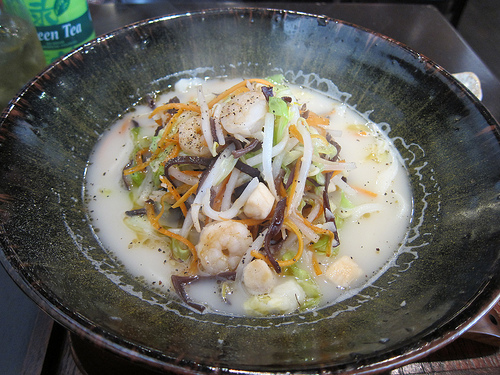 The scallops and shrimp were fine but much better the next time I got the same bowl — yes, already addicted. I also enjoyed the crunch of the cabbage, carrots and wood ear mushrooms. The udon is supple and you are supplied with a giant spoon if you get the soup version. Really, I piled on too much for each bite. Since my bowl was so filling, I didn’t see the need to add extra noodles but you could for another $2. The next time I visited, I added a pork belly bowl. 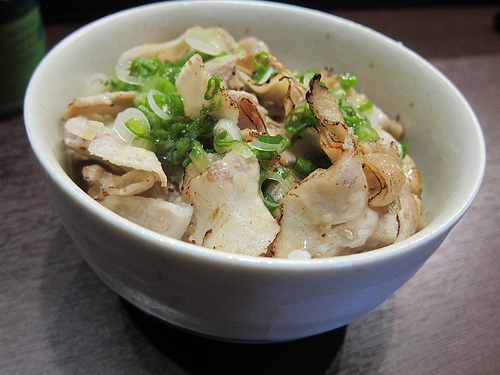 The simple, rustic rice bowl was delicious but nowhere near competition for the udon. 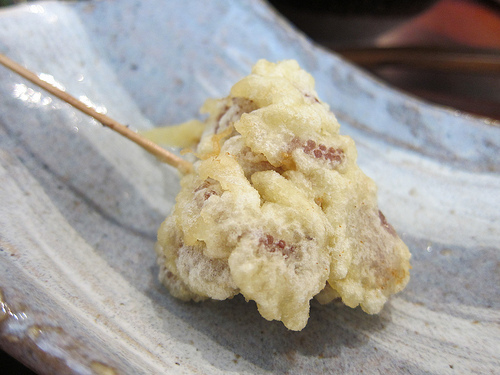 I just loved the octopus tempura but wish I had gotten two skewers. Ah well, what do you want for $1.50? I wised up next time and tried the squid and eggplant tempura. I’ve thought about getting more skewers and tempura when I try this place out with a group. I’m really hoping someone orders the carbonara or tomato cream udon dishes. On yet another visit, I got the beef udon and it was definitely good but it didn’t seem as filling without all the veggies from the champon. I do recommend extra sides or a rice bowl or even extra noodles with this bowl. My other picks would be the duck, curry and cold udon with Jidori poached egg. I’ve also have heard the mentai squid butter udon is great as well. I’m also curious about the salad udon. Chicken salad udon, anyone?